Very similar to the Australian one sheet. Thanks John for posting. Long daybill from 1921. I've never seen it. How about others? and coming up for auction. Where are the original RKO late 1950s Oklahoma daybills, one sheets and 3 sheets? The 20th Century 1960s re-issue image is available but that's about it. 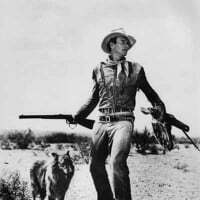 Important film in Australian film history. Released in Australia by the major distributor BEF in 1951 if only limited . 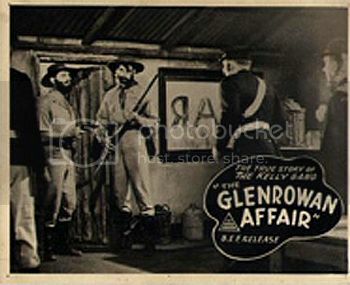 Terrible movie by all reports but it is about Ned Kelly.Where is the daybill or other paper if it comes to that? This piece of advertising is rare. What is that Lawrence? Trade ad? The site I obtained it from doesn't say but I am sure it is a trade advertisement. 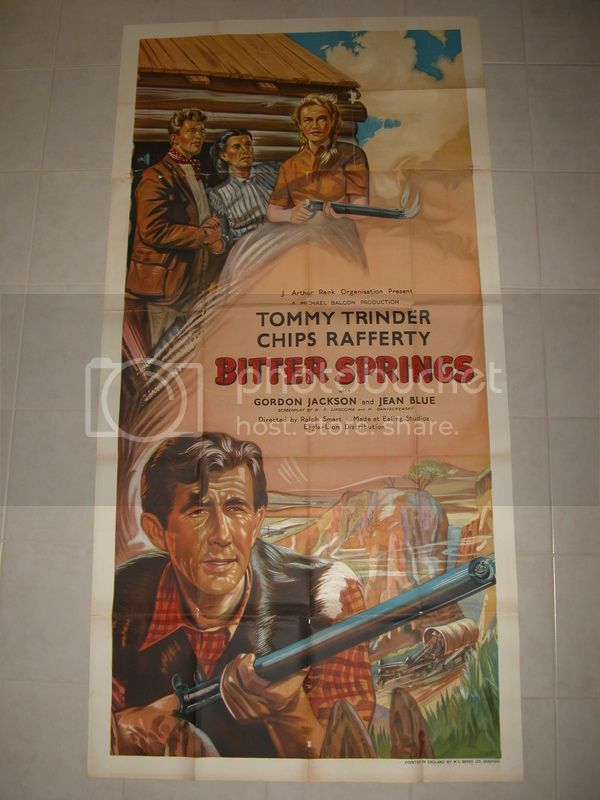 Also on the site are three Australian lobby cards and the following is probably the better of the three. I have just replied to a posting by Pancho a few minutes ago in the ''Looking For a Phantom Daybill''thread, which applies to this thread also so if you are interested in this thread and don't normally access the Phanton thread I encourage you to do so. 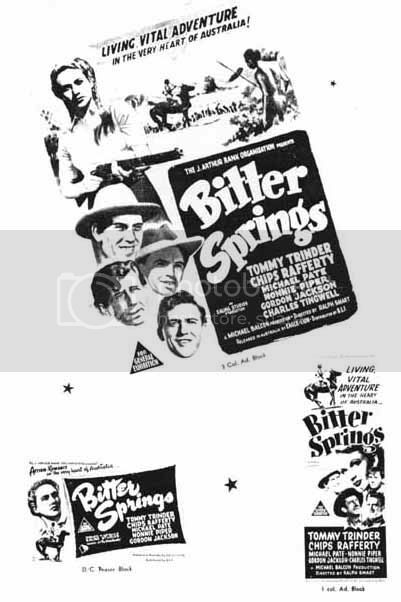 Is there a full colour daybill for Bitter Springs? I haven't seen one - don't know if one exists. This is the only daybill sighted so far but is it an original release, a second printing or a re-release? Is there a full colour version? and the other question: should it stay missing? The fact that you've even posed the question concerns me so, as David says...I think I don't want to know. Keep it to myself it is then. Nooooooooooooooooooo say it isn't so. NO NO NO NO N NO YES! Dagnamit. .. I knew it! OK, I'm ready...hit me with the bad news. 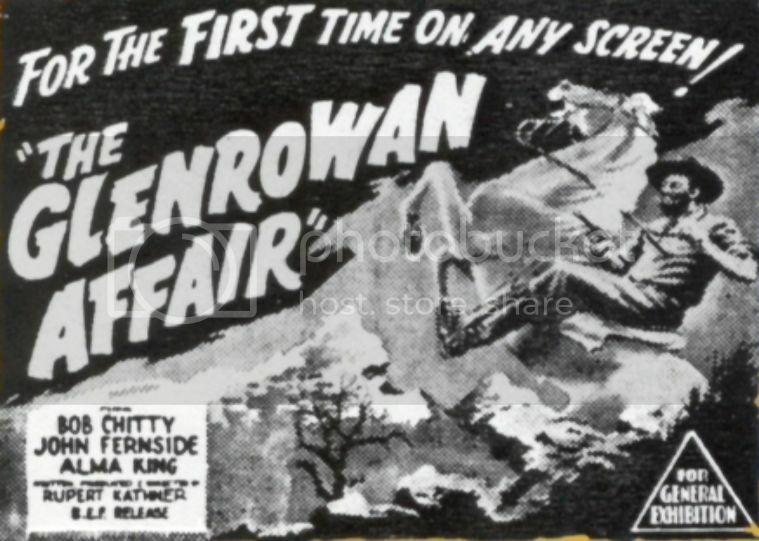 These certainly look like Australian images of a one sheet, daybill & title lobby card from the original release in 1950 to me. Now all one has to do is imagine them in colour and most importantly find where they are. Deep down I knew it would be the case, as much as I didn't want it to be. What does it say under? 1 col. Ad something? I can't make it out. Oh and thanks Lawrence...as much as I hate knowing there is another fabulous daybill out there I don't have, keeps me keen for when one finally does turn up! Those images are of Ad blocks, aren't they? 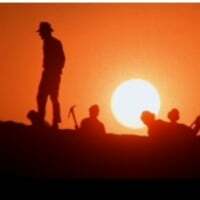 They are not images of the daybills, one sheet or lobby card. Do you know what it says under the images? Those images are of Ad blocks, aren't they? They are not images of the daybills or one sheet. They are listed as add blocks but I believe they are most likely the same designs as the three paper styles I mentioned. I have viewed dozens of advertisements for Bitter Springs and not sighted any of these three designs. All the three designs have For General Exhibition in a triangle on the design the same as what would appear on a daybill and one sheet but not usually a lobby card. All the advertisements I mentioned earlier don't have this type of classification ( For General Exhibition in a triangle ) on them and only the usual censorship rating in words on them. Can anyone produce a trade advertisement with the triangle rating on it as I would love to see one. 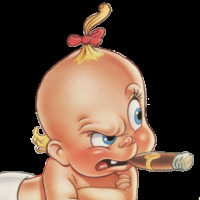 Just checked on the web a large number of Australian trade magazines advertisements and mostly in colour and cannot find any censorship classification on them at all. The add block above with what I am calling a one sheet states colour on it but has the triangle rating on it the same as the one sheet would. 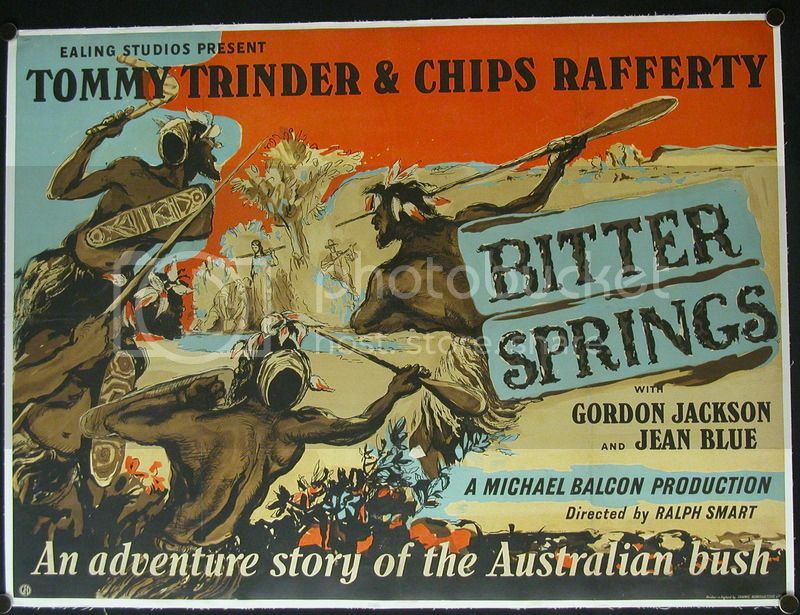 The Bitter Springs limited colour daybill was printed by F. Cunninghame who wasn't printing BEF daybills around 1950 and they only seem to have started re-release and B films for BEF later in the 1950s. 1) The limited colour daybill designed and printed by F. Cunninghame is not original but a second printing or re-issue from later in the 1950s. BEF daybills from 1950 were printed by W.E.Smith of a high artwork standard. 2) The original daybill would have been printed by W.E.Smith in full colour and if not the add block image one of a higher artwork standard than the one we are used to looking at. 3) Although he can't remember completely, Aub. Mosely the poster artist I spoke to, when asked Bitter Springs said he possibly did the artwork. But this one is only a maybe. There may be an earlier daybill for Bitter Springs but that is only a possibility at this stage because no one has seen one. The Ad Blocks in Australian press books often look like they could be the same as daybills or one sheets but are actually completely different. I have hundreds of Aust press sheets and will check for examples when I have time. Has anyone seen a daybill for Monster that Challenged the World (1957)? Yes John, I've got one, although not a great poster. Will try to find it later, along with a request for The Crazies that ui forgot about.